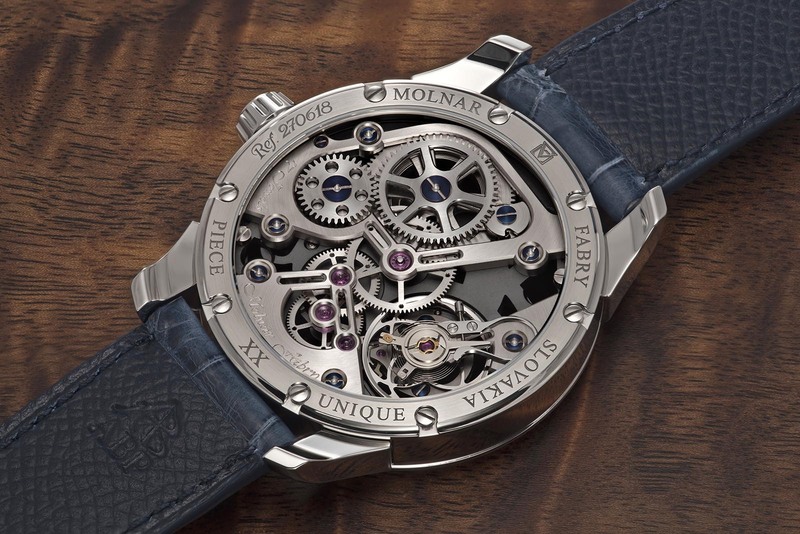 Since 2006, Slovakian watchmaking duo Michal Molnar and Igor Fabry have specialised in creating elaborately decorated, one-off watches using stock or vintage movements (even highly complex calibres), typically to fulfil commissions from clients. 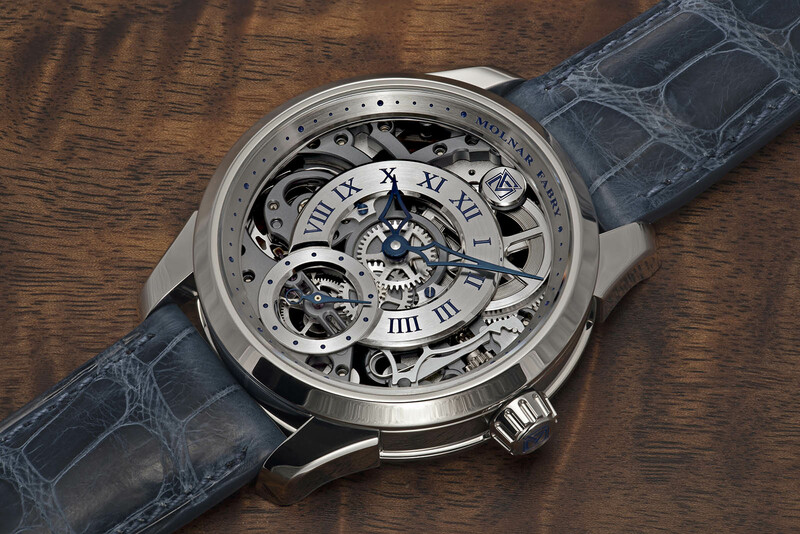 As with last year’s Classic Gentleman Blue, Molnar Fabry’s latest creation, the Tech Art Skeleton, is based on an ETA Unitas 6498-1 that has been modified and skeletonised almost to the point of being unrecognisable. 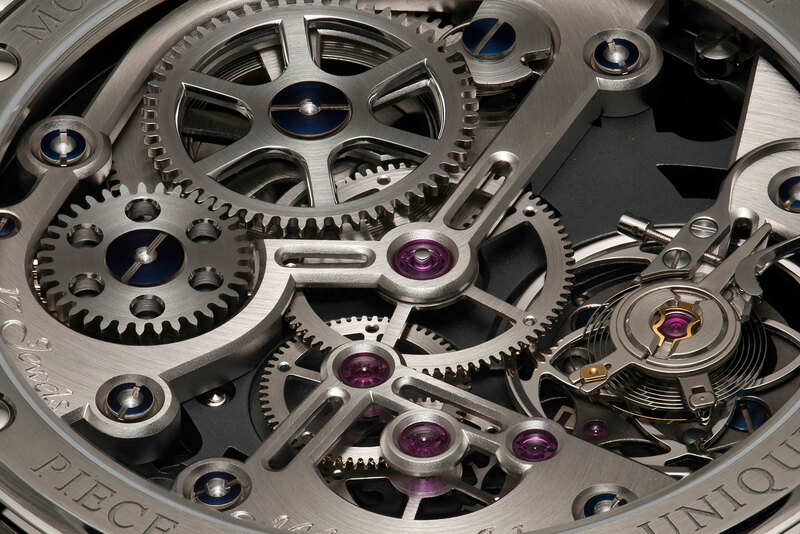 While earlier creations tended towards classical, floral ornamentation on the movement, the Tech Art Skeleton is finished with clean lines and surfaces, and defined by geometric shapes. 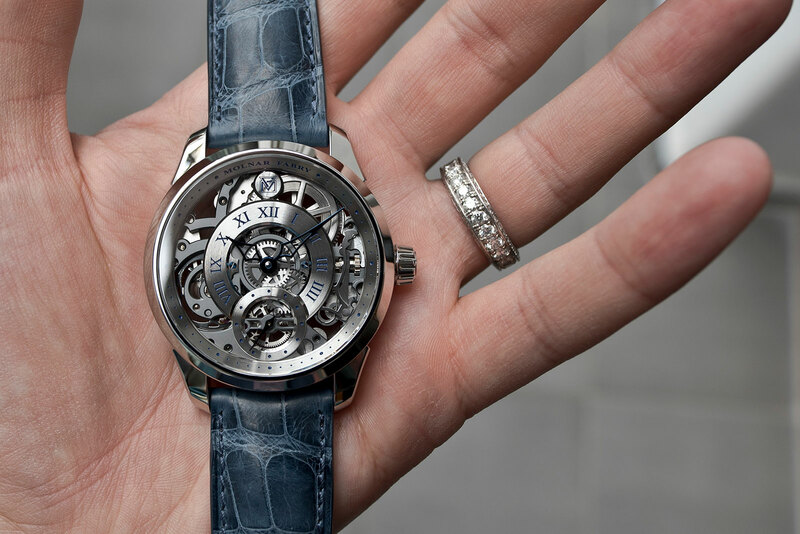 Handmade in-house, the case is stainless steel and 44mm in diameter, a necessary size to accommodate the Unitas calibre, which was originally designed for pocket watches. Both the front and back of the movement have been thoroughly open-worked. 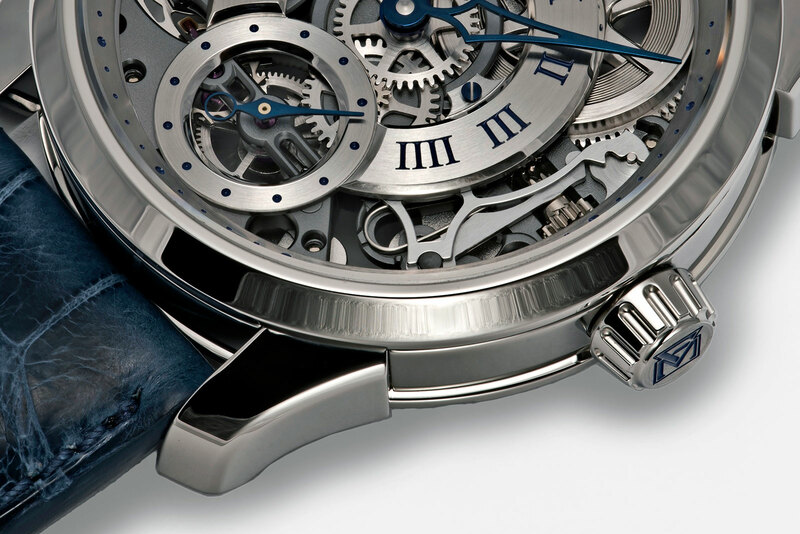 The mainspring, for instance, is visible through the skeletonised barrel, on both the dial and back. All the bridges and wheels are plated in white rhodium for a silvery finished, while the base plate is plated in black rhodium, giving it a dark grey surface. The black rhodium finish is both an aesthetic and functional decision, as it gives contrast to the dial, where the chapter rings for the time are in steel. 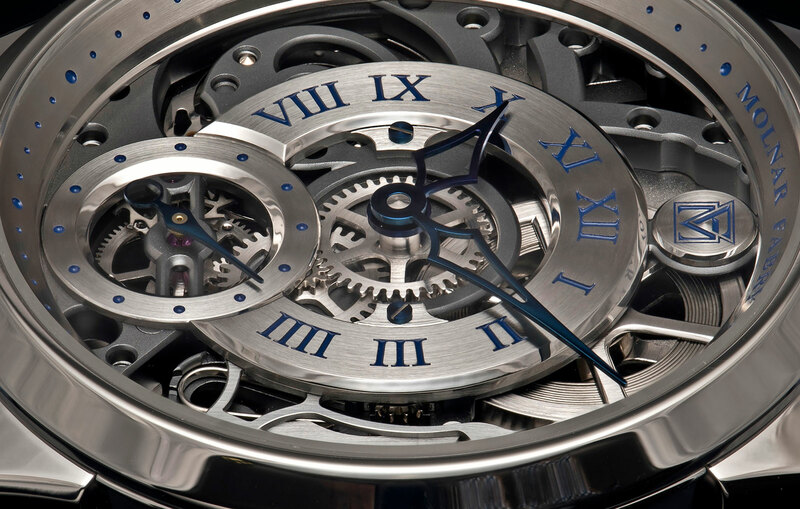 A broad chapter ring carries the hours while a sloping flange has the minute markers. 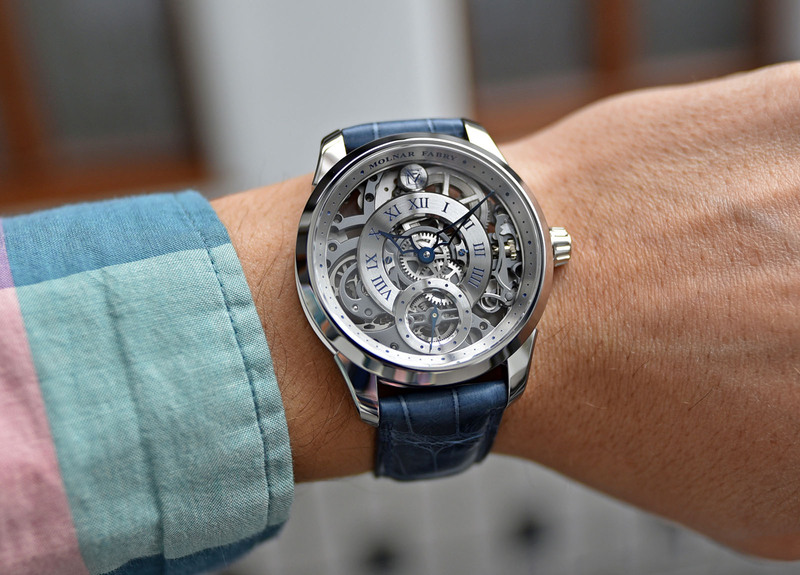 All of the markings are engraved and filled with blue lacquer, matched with blued steel skeleton hands, making time-telling easier than on the average skeleton watch. Notably, while all of the screws are blued, many of them are made in-house and feature a proprietary head, instead of the conventional slot. Besides producing parts such as the cases, hands, bridges, screws and buckles, Molnar Fabry also produces many of its wheels. 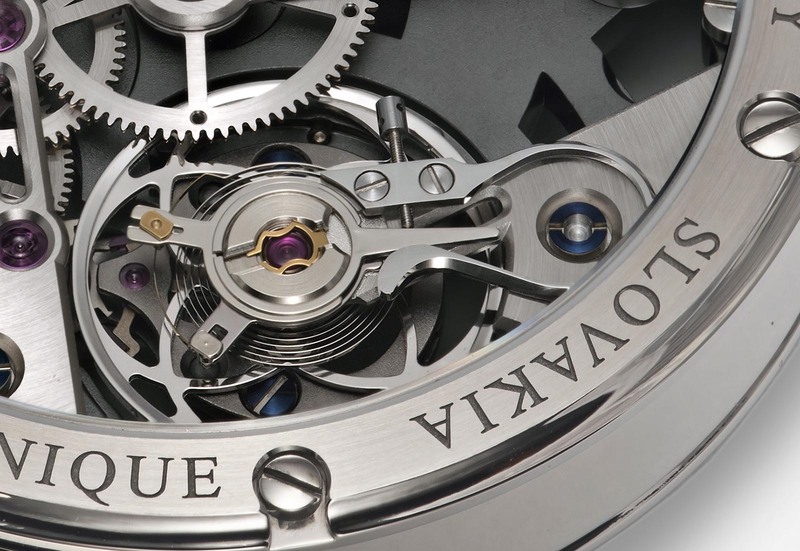 The movement is equipped with a proprietary balance wheel with unusual interlaced, curved spokes. According to Molnar Fabry, the organic form of the balance wheel offers improved amplitude and rate over time, and is paired with a swan neck regulator for micrometric adjustment. 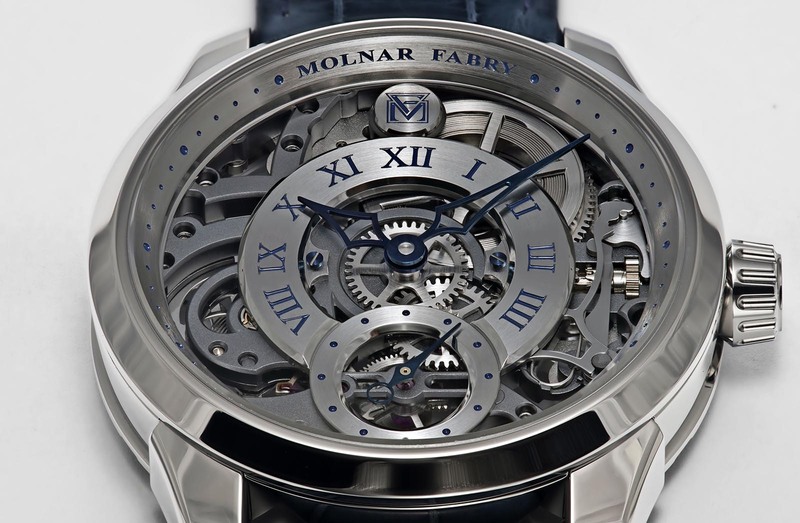 The Molnar Fabry Tech Art Skeleton is a one-of-a-kind creation priced at €14,000.